Bluestuff Intermediate grade Trackday pads or Bluestuff NDX is a high friction sport and race material that can be used for aggressive street driving and certain types of track use. The material has had much success on the track with quality aftermarket calipers (Multi piston systems with better release and cooling and larger rotors) and limited success with street based calipers where pad size and caliper drag can challenge any brake material. 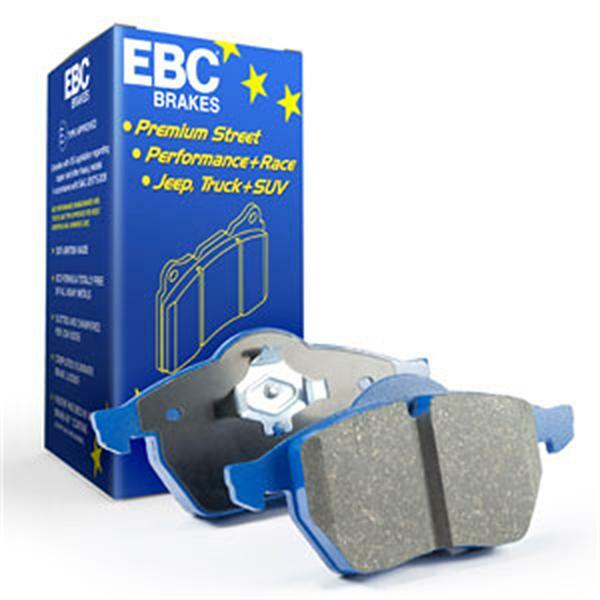 The biggest advantage of EBC Bluestuff intermediate grade trackday pads or Bluestuff NDX is their bite from cold and progressive brake feel and the ability to bring a car to a complete stop. This has led to the ECE R90 brake safety regulation approval of R90 which is now completed and certificates are being obtained (during July 2011). There are certain older street based caliper systems where even the new Bluestuff Intermediate grade Trackday pads will have trouble handling the caliper and slider drag inherent in the systems but this scenario is exactly the same for our competitors. There is NO material that will be PERFECT on the track in all older street based caliper systems. Deep V grooves help venting and catch dirt, dust and debris. Notice the open granular surface texture after the heat scorch (pre-bedding) process. Pad shown is a European 4×4 which features balance weights for noise reduction.